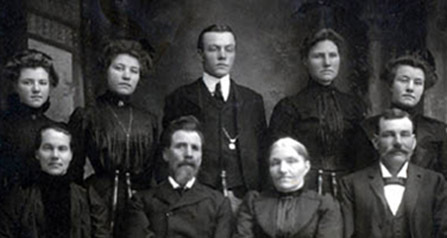 This page will discuss the family of James and Ida (Johnson) Johnson. The following is the wedding announcement for Ida Johnson and James Johnson that appeared in the September 24, 1915 publication of the Stanton Register. immediately after the wedding a four course six o’clock dinner was served. The center piece was a large white wedding cake bordered with sweet peas. When the repast was over, midst rice, old shoes, and various other implements of charivari life, the happy couple left for a short visit in western Nebraska. They will spend a few weeks here visiting with relatives in various parts of the state and expect to home to their friends in Toronto about October the 1st. The picture belwo is of Ken, Stan, Ida, and Jim Johnson. The following is the wedding announcement for Stanley Johnson and Leota Schwinck that appeared in the May 9, 1940 publication of the Stanton Register (page 8 column 4). All the guests were present at the wedding dinner served In the Tally Ho Tea Shop and at the reception at the apartment of the newly weds. Fowing the reception Mr. and Mrs. Johnson left for Baltimore. The bride, a graduate of our city schlools, also attended Midland college where she was a member of the string quartet, the Warriorettes, an athletic pep society; the Wynn social group, and the Y. W. C. A. in which she was active. She was also member of the a cappella choir which made the trip both to the Atlantic and to the Pacific coasts and also to the Texas Centennial. The past three years she was employed at Sioux City, doing secretarial work. Mr. Johnson Is also a graduate of our city schools and attended Doane college, the Wayne State Teachers college and Northwestern University, Evanston, Illinois. After teaching Instrumental music in our city schools for two years, Mr. Johnson was employed by Schmoeller and Mueller piano Company at Scottsbluff. He to now solo cornetist in-the United States Navy Band, Washington, D. C.
Both Mr. and Mrs. Johnson were Active in both instrumental and vocal music during their high school days. The following is the obituary for Stanley Johnson that appeared in the August 31, 1944 publication of the Stanton Register (page 1 column 4). Funeral services for Stanley Johnson. 28, son of Mr. and Mrs. James Johnson, now of Scottsbluff, but formerly of Stanton. are being held this afternoon at 2 30 at the Congregational church, with the Rev. p. J. Thiel of Albion, former Stanton pastor. in charge. Young Johnson died Friday in a navy hospital at Livermore, California of pulmonary tuberculosis. The young man became ill last spring while teaching In the navy school of music at Washington, D. C. and was sent to the Livermore hospital In July. He was a cornet soloist and a member of the navy band the past four years. Before enlisting in the navy, he was band director of the Stanton city schools of which his father was director for many years. He was rated a superior cornetist in many contests. He was married to Miss Leota Schwink of Stanton four years ago. Surviving are his wife. his parents and one brother, Kenneth, a member of the navy band at San Diego, California. The following is the obituary for Stanley Johnson that appeared in the September 7, 1944 publication of the Stanton Register (page 4 column 4). Last Thursday afternoon, from the Congregational church, funeral rites were conducted for Stanley Johnson, who died in a navy hospital at Livermore, Calif., due to pulmonary tuberculosis. The Rev. P. J. Thiel of Albion, former pastor of the Stanton church officiated. Mr. and Mrs. Henry J. Shultz. Mrs. Byron McMahon and Ralph Titus sang two request numbers. Mrs. Jeanette Copes, being their accompanist. Burial was made in the Stanton cemetery with Kenneth Alderman, Longin Koza, Otto Bolz, Fred Schellpepper, Clifford Woeppel and Walter Schellpeper, all class members of the deceased, acting, as pallbearers. Stanley Milton Johnson was born May 28. 1916, near Tilden, Nebraska and when was but six months old his parents moved to Toronto, Canada. When he was five years old, they returned to Nebraska and lived on a farm southwest of Stanton where Stanley attended country school and high school, graduating with the Class of 1932. He then attended Doane College, Wayne State Teachers college and Northwestern University. In 1937, he was elected to teach Instrumental music in the city schools of Stanton, a position previously held by his father. Two years later he accepted a position with the Schmoller & Mueller Music Co. of Omaha, making his headquarters in Scottsbluff where his parents were living. Some months later he went to Washingon. D. C. where he enlisted In the U. S. Navy as a member of the United States Navy band. After playing with this organization two years he Was transferred to the faculty of the Navy School of Music, a position he held until illness forced him to seek medical aid. In May of this year he was admitted to the-Naval hospital at Bethesda, Md. and later was transferred to the Veterans hospital at Livermore and was given an honorable discharge from the navy. He passed away August 25, 1944, at the age of 28 years, 2 months and 27 days. He had the rating of first class petty officer. While confined to the hospital he had become a member of the Livermore post of the American Legion. He was baptized and confirmed in the Lutheran church, but from early childhood attended the Congregational Church In Stanton where he was active In the Sunday school orchestra and choir, as well as director of the choir for some time before leaving Stanton. April 20, 1940, he was united in marriage to Miss Leota Schwinck of Stanton, who with his parents, Mr. and Mrs. James Johnson. and his brother. Kenneth, as well as a host of relatives and friends mourn his early departure. Included in the numerous floral tributes were those of the United States Navy band, Washington, D. C., the faculty of the Navy school of Music, Washington. D. C., as well as two separate pieces from individual Instructors of the school and their families; and those of the Scottsbluff high school band and the Scottsbluff high school and Orchestra Parents club. A contribution in his honor was made to the Red Cross by the graduating classmates of 1932. “Mr. Johnson tells of making a trip to Europe with a band from Toronto in 1914, stating that the band left Quebec May 28, at 4 p.m. on the steamship Empress of Ireland. At 2 a.m. the next morning, a Norwegian coal boat ran into the ship causing it to sink in less than 15 minutes. This disaster, 120 miles from Quebec near Rimouske, took more than 1000 lives and is the greatest lifetime tragedy in Canadian history. Survivors were taken back to Toronto. From there Mr. Johnson sailed two weeks later for Europe on the Empress of Britain and it was on this ship that he met his future bride, Ida B. Johnson of Stanton, who was accompanying her father and sister to Norway, the elder Mr. Johnson’s home country. They met again on the way back at the Toronto Exposition and were married the following year. The following is the obituary for James Johnson that appeared in the January 3, 1974, publication of the Stanton Register (page 1 column 4). Funeral services were held for James Johnson, 88, at the Norfolk First United Presbyterian Church Friday, Dec. 28. The former Stantonite died at a Norfolk nursing homee Dec. 26. Burial was in the Stanton cemetery. James Johnson was born in Manchester, England, on September 19, 1885, and attended Christ Church of Episcopal through the 12th grade. He had two sisters and one brother. All preceded him in death. 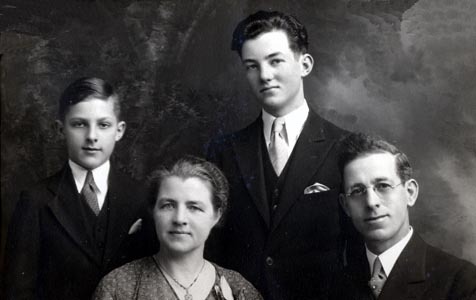 In 1911, he immigrated to Toronto, Canada. While making a trip from Canada to England, he met Ida Johnson, who was making a trip to Norway. They were united in marriage at Tilden in 1915, and to this union were born two sons, Stanley and Kenneth. 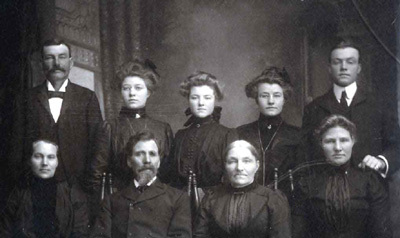 They lived in Toronto until 1925, and then they moved to Stanton. Mr. Johnson taught music in Stanton's Public Schools from 1927-1937, and In Scottsbluff’s Public Schools from 1937-1949, And in Norfolk's Public Schools until his retirement In l956. He was the first secretary and life member of the Nebraska Music Educators Association, and a former member of the Iowa Band Masters Association, and associate member of the Canada Band Masters Association. He was a member of the Masonic Order, Stanton Lodge, for 54 years, a member of Norfolk Presbyterian Church and served as Elder of this Church at Scottsbluff, and was honored with a life membership In the Norfolk's Parent-Teachers Association. He was preceded to death by his son Stanley in 1944, and by his wife. Ida. In 1965. Surviving is his son. Kenneth, and two grand children of Sioux City, Iowa, and several nieces and nephews throughout Canada and United States.